At supper with his friends, Jesus was troubled in spirit, and declared, “Very truly, I tell you, one of you will betray me.” (John 13:21 NRSV). Jesus was not the only one who had a problem with Judas. I have some problems with Judas, the role he played and his reputation. It is true that Judas betrayed Jesus in the most horrendous way. On the other hand, if it was God’s will for Jesus to be crucified as He was, didn’t Judas fulfill the role God intended him to play? As I think of who Judas was and what he did, to me the most powerful thing was that in spite of what Judas did, Jesus still loved Judas. In so doing, Jesus did Himself what He taught about “love your enemies” in Matthew 5:43-48. Whatever it is that we are suppose to contemplate today; this part of the Holy Week story is mysterious at best. Perhaps Judas reminds us of being at a holiday dinner table with the one relative that is the most challenging for us to get along with. If you are like me, the hardest thing to do with someone like that is to keep my mouth shut and avoid letting that person get under my skin. If Jesus’ encounter with Judas teaches us nothing else; it shows His humility in accepting what was to happen to Him. Indeed, the hardest part of St. Benedict’s chapter 7 on humility in The Rule to understand and accept is rungs six and seven. On rung six of the ladder of humility, St. Benedict tells the monk to be content with “the lowest and most menial treatment.” On rung seven, the monk is told to admit “with his tongue and be convinced that he is inferior and of less value.” It is a mistake for us to interpret Benedict as saying that the monk is suppose to have a low self esteem or accept abuse in any form. What he is saying is that we tend to be all caught up in our false-sense of self. We like our first place in line. We like to be approved of. Liked. Cherished. No one is as important as we are individually. St. Benedict is telling us to live as Jesus did. He is telling us to accept and live into from our true sense of self, our essence even when we are last on the likable list. St. Benedict is teaching us to find our worth, our stature, our place in line; in God alone. St. Benedict is telling us what Jesus is showing us. Let go and trust in God alone. How is Jesus challenging you to live from your essence today? 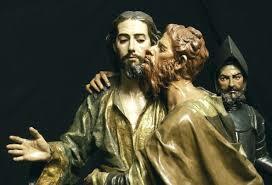 Holy Wednesday Reflection: What Do We Do With Judas? When he had gone out, Jesus said, “Now the Son of Man has been glorified, and God has been glorified in him. If God has been glorified in him, God will also glorify him in himself and will glorify him at once.” (John 13:21-32 NRSV). I have on various occasions struggled with Judas. Traditionally, Judas is the one who betrayed Jesus. Such is written in Sacred Scripture. On the other hand, Judas also did what God wanted him to do in helping to bring about the salvation of the world through Christ, did he not? Is it possible that we are missing the point? As I searched for images of Judas to use for this blog post, the only ones I could find depict him kissing Jesus in betrayal. A loving gesture with an ulterior motive. Our problem is that we are focusing on Judas, when the person who really did the most loving thing in the story is Jesus. Our Gospel story of Jesus at the table with Judas, as well as the scene during which he kisses Jesus all tell us something very important. Jesus still loved Judas. As we meditate on this Holy Wednesday as we prepare to begin the Sacred Triduum of Easter, we might reflect just a bit on how committed are we to love everyone around us. Do we give others, even those with whom we are in conflict a true kiss of peace? Do we accept and love those who give kind gestures to us with ulterior motives? What example of Jesus will we give today?